Listen to the names of New England rivers, its towns and states: Sippewissett, Skowhegan, Connecticut, Penobscot... the sounds flow like forest streams carrying a hidden story—an Indian story of America from beginning to present. Language of America takes us deep into New England's last surviving Indian places and languages, revealing a 9,000-year-old success story that's been pushed to the edge of extinction by a government that proclaims "diversity" but doesn't want to practice it with Native peoples who resist being assimilated. Meet Allen Sockabasin, singing his child into becoming a Passamaquoddy speaker; Jessie Littledoe, who against all odds, has brought back her Wampanoag language that had not been spoken for 200 years; and Ella Sekatau, who still refers to non-Indians as "the strangers" and has never forgotten the sacred Narragansett ceremonies. Language of America explores Indian language, philosophy, and community as never before. It shows how Indian words reveal an inherent connectedness between people, nature and spirit. 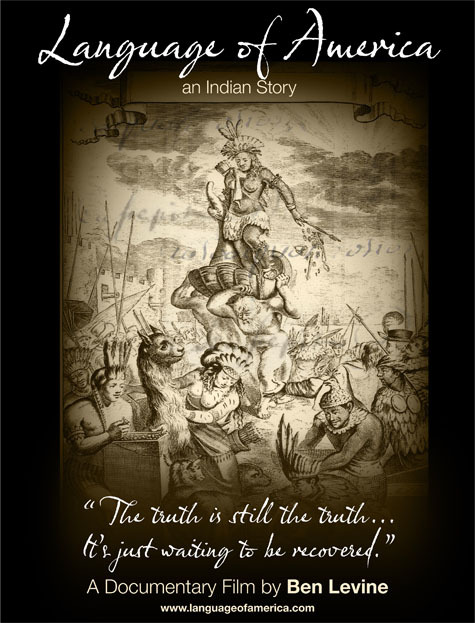 The film bears witness to America's history of Indian human rights abuse, yet it inspires hope by promoting an understanding of diversity that accepts Native peoples’ inextricably shared history and destiny with their neighbors.